The prints are enormous—about 24 x 32 inches each. I knew that I wanted the frames to be special, and to have a classic, timeless look that I could carry with me long after I've moved from our little place in the East Village. To accomplish this, I turned to the designers at Framebridge—a completely online custom framing service that allows you to either ship them or upload artwork, and then preview the final product in any one of their framing options. Tessa Wolf, Frambridge's Creative Director, sent me options to look over as well as some ideas about why each frame worked well with the Matisse prints. But the frames were just the beginning! I had a lot of questions about what came next: choosing a place for my art. I convinced Tessa to take a moment and answer some framing and decor questions which, I hope, will be as helpful to you as they have been to me! FRAMEBRIDGE HAS A TON OF FRAMING OPTIONS. HOW DID YOU NARROW DOWN YOUR OPTIONS TO THE 4 FRAMES YOU SUGGESTED FOR MY MATISSE PRINTS? Because these prints are so modern and bright, I thought they looked amazing with our Clean frames—Marin (which gave them a light, Danish modern feel) and Mercer Slim (super sharp gallery frame). I really loved how Richmond, our thin, classic gold frame, gave the pieces a warm, sophisticated feel. I also wanted to include something a little different and unexpected, so I went with Jambi, our tiger wood frame, which lent the pieces a rich, and almost masculine, perspective. I ENDED UP CHOOSING THE RICHMOND FRAME—I'M A SUCKER FOR GOLD. WHAT KIND OF VIBE DO YOU THINK THE SIMPLE METALLIC DESIGN GIVES OFF? I absolutely love our Richmond frame and its sister, Newport, which is silver. Richmond has an elegant, traditional face, but still feels really modern because of its gallery-like profile (thin and deep). I love the antiqued detailing, which keeps the gold finish from distracting from your art. In my opinion, anything in Richmond feels sophisticated and timeless. SO I MADE THE RIGHT CHOICE FOR MY (NEWLY) BELOVED MATISSE PRINTS? 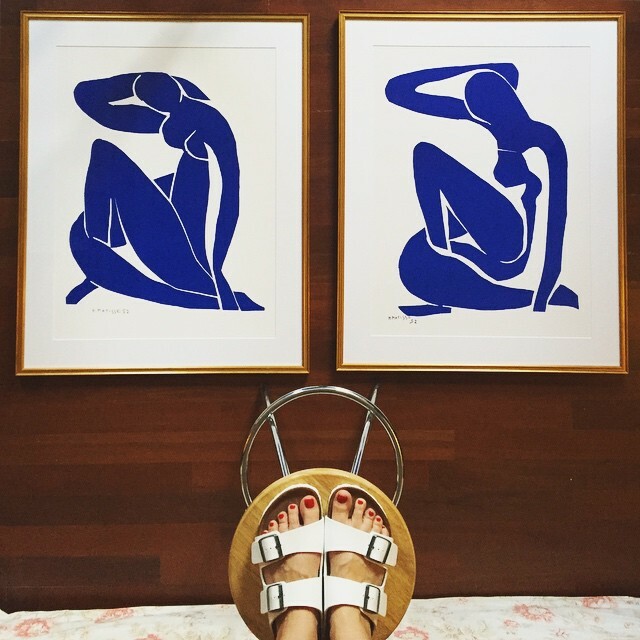 I absolutely love Matisse, so I was really excited to see your prints! His work is so bold, crisp, and emotional, and it makes a beautiful impact wherever you hang it. With bright, modern pieces like these, people tend to go with a really clean, modern frames (which, as we know, always look amazing). I was really happy to see you choose Richmond, a classic and delicate frame to pair with these prints because it gives the set a totally different, but amazingly beautiful, classic vibe. Plus, gold is killer with blue (color theory! ), don't you think? MORE GENERALLY, WHEN YOU LOOK AT A PIECE OF ART THAT NEEDS FRAMING, WHAT ARE THE FIRST THINGS YOU CONSIDER? WHEN IT COMES TO MAT VS. NO MAT—WHAT LOOKS BEST WITH WHICH KINDS OF ART OR PHOTOGRAPHY? ANY TIPS FOR DECIDING? Generally, I like most pieces better with mats rather than without—they add airiness and impact to small pieces, and truly bring the viewer’s eye right to the subject. Bonus—they can cover up imperfections like wrinkled corners or uneven margins, too. That said, I am always surprised by how much I love vintage posters, large-format photography, and pieces that are intended to be framed and hung together (like triptychs) without mats. Oh my gosh—I have a million! We created a whole page of detailed tips, but here are the biggies: People always hang art too high. If it’s going above a piece of furniture, the bottom of the art should be 8 to 10 inches above the furniture. If it’s hanging on a wall by itself, the center of the art should be 57 inches from the ground. If you're hanging a gallery wall or small grouping of pieces, you should think of them as one big piece for hanging purposes and follow the same rules for placement. We love gallery walls, and the best thing about them is that there are so, so many ways you can make them look great—collecting photos and memories throughout the years and framing all of them in the same frame style, finding an artist you love and framing several of her pieces in dramatically different frames, or starting with a few random pieces you love and adding to the collection vertically until you reach the ceiling like a salon wall, etc. I recommend that, if you're starting a wall from scratch, you choose one unifying element—color, size, finish—and carry that theme through all the pieces you choose. If your art is an eclectic mix of bright pieces, go with a combo of white and silver or natural wood frames—different widths, different textures, but similar color and tone. And don't be afraid to mix metallics! Some of our favorite gallery walls proudly feature gold, silver, and champagne frames. I FOUND WORKING WITH YOU AND THE FRAMEBRIDGE TEAM TO BE SO EASY AND COLLABORATIVE. CAN YOU TALK A BIT ABOUT WHAT GOES ON BEHIND THE SCENES WHEN A CUSTOMER CHOOSES "DESIGNER'S CHOICE"? About two days after we receive your art in our studio (which is right away if you uploaded a photo or a few days after you ship your art to us), our designers will physically lay out your art with each of our mats and frames to see which combinations they like best. They'll precisely measure, photograph and photoshop each piece so color and aspect ratio are true to the work, and then mock it up in each of their favorite choices on our site. They write a short description for each option so you can better understand why they loved it, and send you the mockups to choose from. It’s so much fun for our designers and for our customers. It’s just so special to get to interact with our customers and their art in this way. Tune in soon to see how I incorporated my newly framed art into my room—I've spruced up my little windowless den into a bright, relaxing haven—all inspired by these vibrant Matisse prints. WANT TO TRY FRAMEBRIDGE FOR YOURSELF? USE THE CODE 'LOVETHAT15' AND RECEIVE 15% OFF YOUR FIRST ORDER! *Framing for these prints was graciously provided by Framebridge.